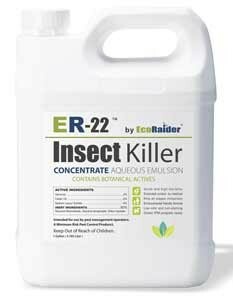 ER-22 refers to the product’s 2x strength of EcoRaider’s existing ready-to-use (RTU) bio-insecticide formula. With no signal words, cautions or restrictions on its label, the product is designed to be an efficient and green solution that delivers both quick kill and strong residual for bed bugs, including resistant populations, the company says. ER-22 is also labeled for perimeter ant control. It is offered in 1-gal. jugs, four to a case. ER-22 can be diluted up to a 1:1 ratio for bed bug treatment and 5:1 for perimeter ant applications.